"Trying Out Comforts of Shipboard Life"
Gena Delaney, of Oakville high school, made the presentation of the handsome silk ensign. 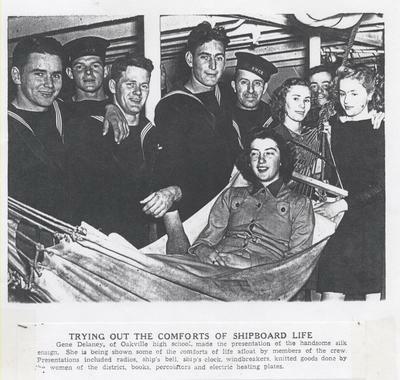 She is being shown some of the comforts of life afloat by members of the crew. Presentations included radios, ship's bell, ship's clock, windbreakers, knitted goods done by the women of the district, books, percolators and electric heating plates.